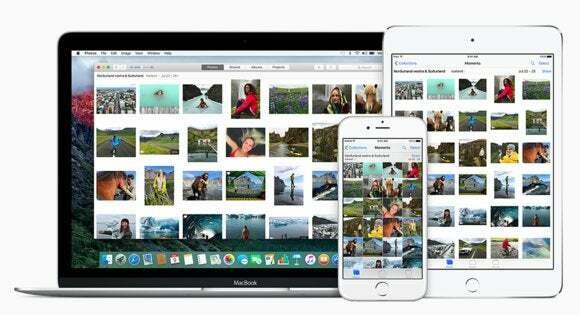 iCloud Photo Library, when it fits your needs, is a great way to avoid having to manage where your images and videos wind up. You capture video on your iPhone or drag an image into Photos in macOS, and it just syncs everywhere while making a central copy at iCloud. While I hear regularly from people having difficulty with aspects of it, it's a way to reduce the stress about how much storage you have on any given device, especially iOS devices. However, there's one configuration I can't advise, and Macworld reader Eric writes in with a question that prompts a discussion. He's wondering if he could rely on iCloud to be his "main backup of images." The short answer is no, but it's not about distrust in Apple's technical abilities. Rather, about the frailty of all material things, and the risk of putting all one's digital eggs in one basket, no matter how firmly the basket-storing company is holding that basket. You can also enable this in Photos for macOS (Photos > Preferences > iCloud), but if you enable this feature on all linked Macs (whether that's one or more), you no longer have a full-resolution copy of all your media. Your local copy of Photos reliably retains only images and videos you've viewed or that it hasn't shifted to a thumbnail only storage. There's no way to control which media remains locally cached at full resolution. The Photos Library resides on an external drive. That drive is backed up continuously to a cloud-based provider (Backblaze). I have iCloud Photo Library enabled with full-resolution storage on my Mac. Eric also asks if Time Machine copies high-resolution or thumbnails when you have Photos in macOS set to use optimized storage: Time Machine only copies data that's stored locally, so any images or videos that exist only as thumbnail views locally will be backed up in that fashion. Conceivably, Apple could create a kind of high-level iCloud API that it could offer to other cloud-hosted providers to use with details you provide, so you could perform additional, non-Apple backups off-site encrypted backups. I can't imagine the company doing that, because that sort of behavior signals to users that the service is less reliable, when it would in fact offer more reliability on top of what seems to be completely solid reliability. We’ve compiled a list of the questions we get asked most frequently along with answers and links to columns: read our super FAQ to see if your question is covered. If not, we're always looking for new problems to solve! Email yours to mac911@macworld.com including screen captures as appropriate, and whether you want your full name used. Every question won’t be answered, we don’t reply to email, and we cannot provide direct troubleshooting advice.